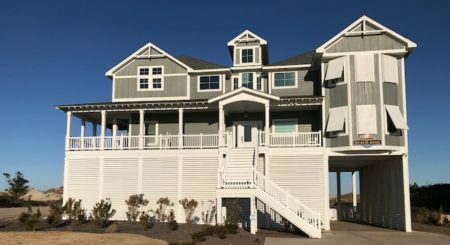 This is an ocean front house in Nags Head we just completed some home automation work on. We installed 3 smart thermostats and 20 smart light switches for all the exterior lighting on the house. This is a seasonal rental and the home owner wanted to control the heating/air conditioning, and the exterior lights. With smart thermostats he is able to remotely see what the temperature is on for all 3 floors of the home. He can set the temperature up or down, and he can switch from heating to cooling, or he can cut them off; all remotely from his iphone or desktop computer at home. All this is done with a free app we loaded onto his iphone and computer. Also with the thermostats, we programmed them for a maximum heat setting and a minimum cooling setting. With his lights, he can remotely see which lights are on or off. He can remotely cut them on or off, individually controlled. With the lights we programed a sunrise rule; at sunrise, all the exterior lights will automatically shut off. This includes all the lighting around his pool and the lighting around his back yard. This is important to the home owner for energy savings, and lengthening the life of his heat pumps and light bulbs. 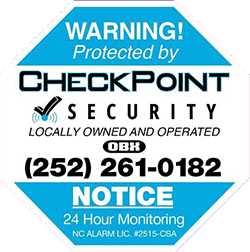 CheckPoint does all the install, and programing for all these features. We use Z-wave devices that all communicate back to our home security panel out to a third party app, Alarm.com, that allows the homeowner to remotely control all the heat pumps and exterior lighting. This project is the first of 3 ocean rentals we will do for this client.